The GLOCK 23 .40 S&W pistol is a gun I've had my eye on for some time. I've been so happy with the GLOCK 22, carrying it several times weekly in casual clothes, I began to wonder just how much difference the slightly smaller G23 would make as far as concealment. As with all GLOCKS, there are numerous good holsters for the G23. I had no doubt that it would be a bit easier to cover. And I figured it would be a bit more comfortable when sitting for long periods of time with the gun tucked in an inside the waistband holster. So, I decided to stop wondering and go ahead and make the jump. A few weeks ago, (today is 12/2/2009) I purchased a GLOCK 23. At the same time I purchased a set of TruGlo TFO night sights to replace the horrible plastic sights that come on GLOCKS. I immediately liked the way the slightly smaller gun felt in my hand. Having an affinity for GLOCKS anyway, I know that in general I do well with them as far as grip angle, hand size, etc., I was not surprised that the gun fit me well. I've used a friend's GLOCK 27, and while I liked it, I found it just too small with my finger hanging off the end of the grip. Plus, I just don't like small guns much, and only use them because they allow me to carry when I otherwise can't. But in general, in casual clothes, I have favored a larger if not full size handguns which the G22 has fulfilled nicely for the couple of years before I bought this gun. The G22 was my "confidence" gun, being familiar with its feel, accuracy, etc. I knew it would take a real convincing performance from the GLOCK 23 to convince me to (God forbid) switch my primary carry pistol. So a couple of days after I bought it, I mounted the TRUGLO TFO sights. Then I took off to the Old Fort Gun club with some circle and silhouette targets to try out the G23. The first hundred rounds I used on that day were Remington Express pistol ammo loaded with 180 grain jacketed hollow points. 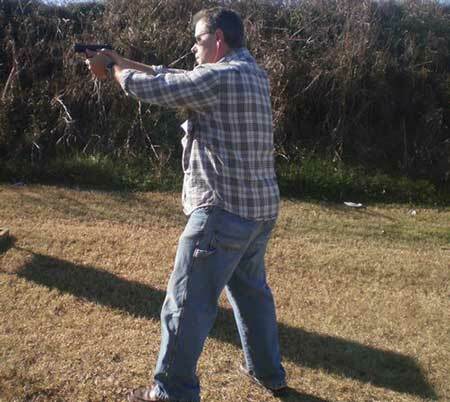 The GLOCK performed as expected and I had a ball as I quickly went through the 100 rounds shooting off hand from standing, sitting, lying and moving positions. 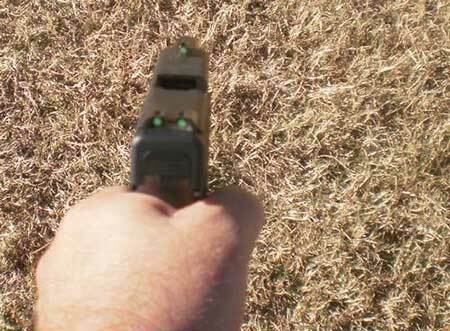 There was virtually no difference in the felt recoil and accuracy between the GLOCK 23 and the G22. In fact, I was pretty amazed at how similar the gun felt to my familiar carry pistol. I obviously had a gun that could possibly replace my beloved G22, but a few more tests were in order. So, the next trial on the pistol was the Right On Target shooting group outing. There we put another hundred or so rounds through it with the same results in my and others' hands. Finally, I took the GLOCK 23 back to the Old Fort Gun Club for another run. This time I really attempted to wring out the practical accuracy of the gun by carefully aiming and shooting from various distances. I was actually amazed at the results which were easily as good if not better than what I was used to achieving from the GLOCK 22. My daughter was with me on this day and we were shooting everything, but I could have stayed all day to shoot the G23. The gun just shined. 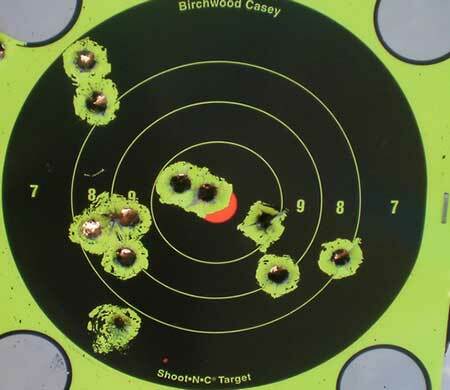 I shot it at some Shoot N See targets and these are some typical results on five inch targets from 45 feet off hand shooting steadily at a speed that just allowed me to realign the sights after each shot. The last two range sessions mentioned were primarily with 165 grain reloaded copper plated bullets. I fired a couple of the Winchester self defense ammo bullets I carry in the gun and put two shots touching each other from 45 feet off hand, with one touching the bulls eye on a 5" target. So, by the time I got done with this range session the G23 had well over 300 rounds through it. It had proven that it would make a suitable and slightly more concealable alternative to the GLOCK 22. That's something I just didn't think I would be saying, having confidently shot and carried the G22 for over two years. So, the G22 is now sold, believe it or not. Hard to give up, but the smaller, more concealable gun is the logical choice for my self defense carry needs now. The specs for the GLOCK 23 are as follows: CALIBER .40, SYSTEM Safe Action, WEIGHT 21.16 oz., LOADED 31.03 oz., LENGTH 6.85 in., HEIGHT 5.00 in., MAG. CAPACITY Standard: 13, OPTIONAL 15 / 17, WIDTH 1.18 in., BARREL HEIGHT 1.26 in., TRIGGER PULL 5.5 lbs., TRIGGER TRAVEL 0.5 in., LINE OF SIGHT 6.02 in., BARREL LENGTH 4.02 in. , BARREL RIFLING right hand, hexagonal, LENGTH OF TWIST 9.84 in. 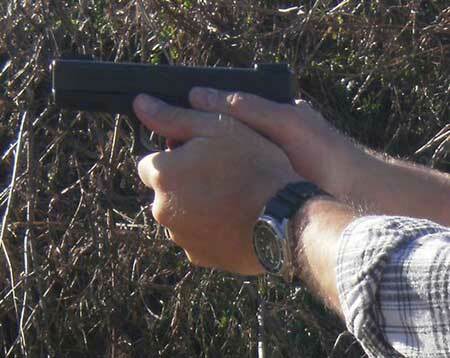 Bottom line: The GLOCK 23 like all GLOCKS is dependable, accurate, and fun to shoot. It gives a full, but slightly shorter grip, and 4" barrel. Those slightly smaller dimensions make it easier to conceal than the full size G22. And with the equality of accuracy and recoil, if you're looking for a good, dependable carry gun that you can also enjoy shooting all day long, the GLOCK 23 is your gun. 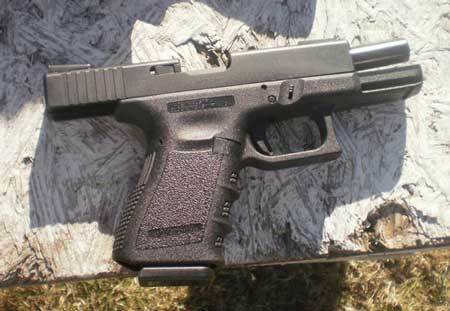 UPDATE 9/20/2011: After two years of carry and regular shooting, with several thousand rounds through the gun now, the G23 continues to operate perfectly. In casual clothes, it is the ideal carry gun for me. A satisfying and fun gun to shoot too. UPDATE 9/2013: Still with me, going strong. UPDATE 7/2014: The GLOCK 23 is one of the few guns that has found a long term home. It shoots like it did when it was new. Now with me for 5 years, the gun is still a near daily carry piece. Now with around 3000 rounds through it, always dependable, always controllable, always accurate. UPDATE 2018: While I don't still have my G23, I bought another one, another Gen 3 model of the GLOCK 23 .40S&W, to keep as one of my carry guns. It keeps its long time place in my protection arsenal, along with a couple of S&W guns. Still a gun I count on and know its unending dependability.